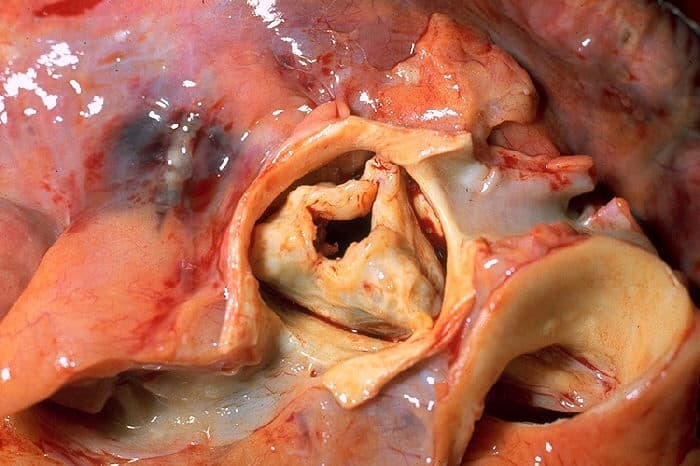 Aortic Stenosis is the narrowing of the three cusps that form the aortic valve. It is distinct from aortic sclerosis which is generally a milder precursor to aortic stenosis. Aortic Stenosis is typically progressive, with symptoms becoming gradually worse over time. The first presentation usually occurs with shortness of breath on exertion. Ejection Systolic murmur best heard in the aortic area, ( Right 2nd intercostal space at border of sternum), radiating to the caroitds. Used to estimate the pressure across the valve. Surgical –if symptomatic, then the prognosis is poor (above) and prompt valve replacement is recommended. Valve replacement is also recommended for patients with ECG signs, and moderate to severe disease on Doppler / cardiac catheterisation.